Contractor - Kessler Construction Co. The site of a magnet school in Bloomfield, CT. was underlain by approximately 25 feet of loose sand and silty sand. There were two primary concerns with construction on the loose soils. The first concern was foundation settlement. The second concern was liquefaction potential. 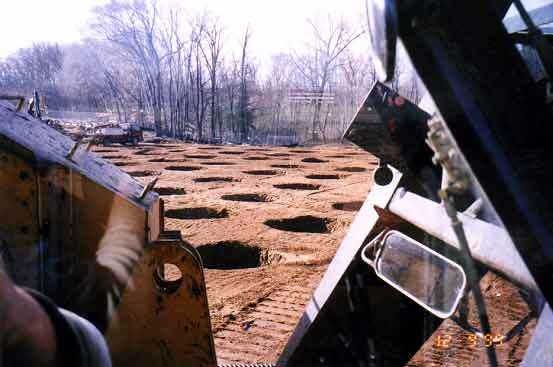 The two primary alternatives to densify the site were dynamic compaction and vibrocompaction. Dynamic compaction was selected as the more appropriate technique, due to the greater ability of dynamic compaction densifying the more silty sands and the lower cost associated with dynamic compaction. TerraSystems performed the compaction work with a 15 ton weight dropped from heights of 50 feet. Compaction depths of up to 25 feet were achieved, based upon standard penetration testing performed before and after compaction.